Update: The Shelter construction was completed in October of 2016! The shelter is now open, and serving the animals of Jones County, IA. Read about our journey to shelter completion below. In May 2006, AWF embarked on a campaign to raise funds to build an animal shelter in Jones County. Over the past 10 years, the organization has raised $246,544 towards this goal. 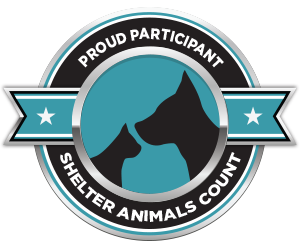 In 2012 AWF was able to make the first step to attaining the goal of building a shelter in Jones County. The organization purchased land to be used for construction of a shelter in Jones County. The land is located just north of Monticello at off Highway 151. This land is 8.68 acres that will provide a home for the animal shelter, a dog park and hopefully many other animal related events. 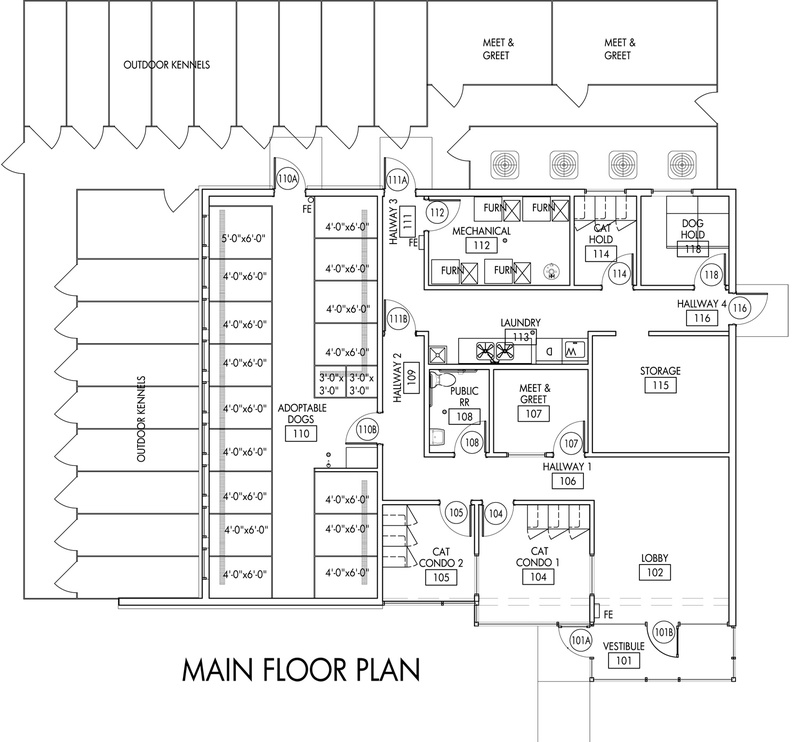 Since this purchase, the AWF board has been working on the plans for the animal shelter in Jones County in conjunction with our architect, Sarah Coleman of Martin Gardner Architecture. 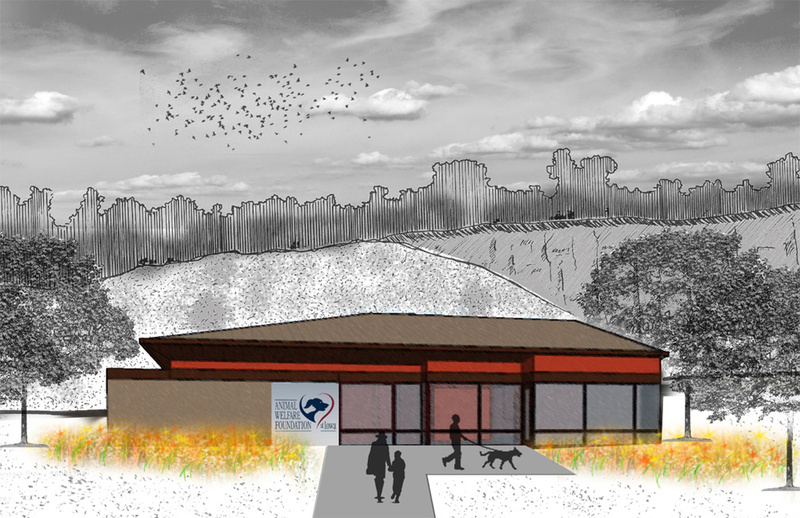 A proposed rendering of the AWF shelter from our architects. 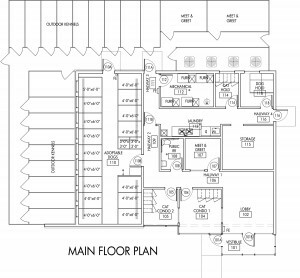 We have renderings from the architect showing a preliminary floor plan, outward appearance, and the location of the building, septic, and well on the land. We would like to have a 6,000 square foot building, but reality dictates that we need to start out small and leave room to add on later as more funding becomes available. We have determined that if we can get the septic, well, and utilities in along with a road, then we can pour 3000 square feet of concrete for the floor and construct the building over it. We could then make sure all utilities are hooked up to the building, put in a bathroom, and a mop sink. We would then put in some used dog kennels and cat condos that we are hoping to purchase from Dubuque Regional Humane Society. The building would, in no way be finished, but it would fulfill our requirements of an “animal shelter” license, and we could work out of it. An animal shelter usually costs $250 per square feet to construct. This would mandate $750,000 for a 3,000 square foot shelter. If we build the minimum, as we mentioned above, we figure that we can do the simple basics for $525,000. Since we have an “Animal Shelter” license from the state of Iowa, this license requires that we have a facility. The Cat Adoption Center fulfilled that requirement. However, since the Cat Adoption Center caught on fire on October 20th, 2013, we no longer had a facility. Recently AWF was able to rent a small office in Olin, Iowa to fulfill the location requirements for the state of Iowa. This is a temporary situation until the shelter is built. We really need everyone’s support to help us start construction on the shelter. Support can come in many forms. Obviously, cash donations are a big part and we have many options for donations including monthly withdrawals from your account, donations through PayPal on our website and Facebook page, or simply mailing a check to our PO Box. Other ways you can help, is to get the word out about what AWF is trying to do. By doing this, other donations may come in, such as donations from businesses for materials and/or labor or maybe donations for prizes for other fundraisers we will be having, such as a golf tournament in August. Another view of the proposed shelter rendering. We also have a fundraising committee that is always in need of additional volunteers. If you are interested in being on the fundraising committee, contact Candy Roberg at robergcandy@hotmail.com or David Boehm at dboehm82@yahoo.com. If you are good at asking people for donations, the fundraising committee would be a great place for you or maybe you would like to be the chairperson for our Capital Campaign. Remember, this is your shelter, Jones County, and it needs your help. At least one Board Member will try to be at every event AWF has. Come out and see us, ask questions, and view the pictures we have regarding the animal shelter we are working on constructing with your help.